Elusive design can sometimes be deceptive. After all, you can’t judge a book by its cover right? JBL has come up with an interesting design that is almost an art form first and technology second, so my question was whether this speaker system could live up to the JBL name or was this some extravagant exploration of form and function with the balance tipping in favour of form? Having spent the last few weeks putting the JBL ‘Spot’ 2.1 speaker system through its paces, I’ve come to the conclusion that form did win, but it wasn’t a complete victory because there is an inkling of quality coming from it. 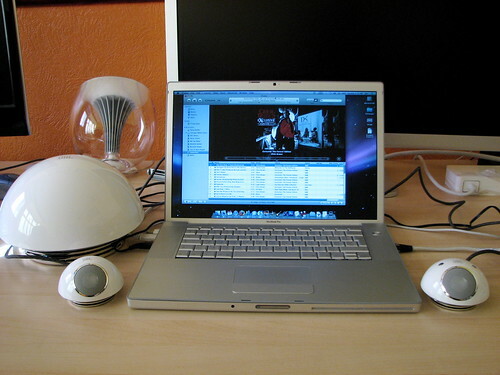 I have to admit, the design is appealing with the glossy white (or black if you choose the alternative shells that come with it) subwoofer and dinky satellite speakers make it great for laptop setups, like mine. 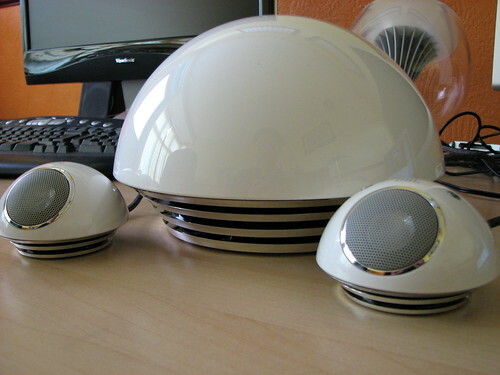 The typical subwoofer box has been replaced with a round mushroom shaped dome that sits on your desk. 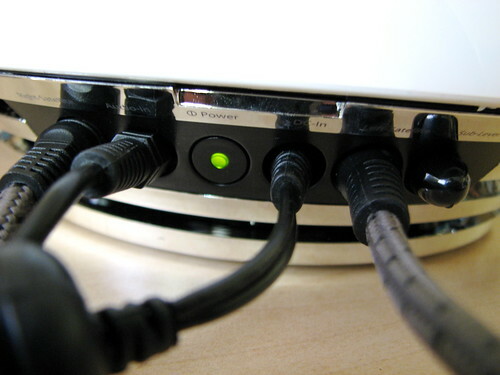 This also includes the amplifier and connectivity. Volume controls are built in to the right satellite speaker and uses what appear to be touch-sensitive controls, however a light press is required to actually make them do anything. Tapping both the volume up and down buttons mutes the speakers entirely. 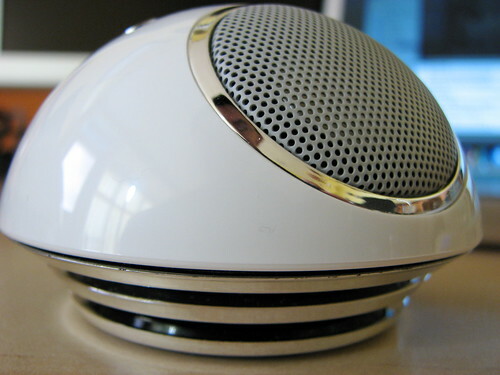 The Spot has plenty of distortion free volume, a good sign that these aren’t just some cheap speakers in a fancy shell. Bass response is good but nothing that will blow you away. A dial at the back of the subwoofer can be used to adjust the bass levels to your taste, so if things do get a bit crazy then you can turn it down. Typically with a product that has a focused design principle behind it, some sacrifices have to be made in order to maintain those principles and design concepts. I bring this up because the main power button for the system is located at the back of the subwoofer, right in the middle of all the cables. So to begin with, it’s actually quite difficult to reach over and hit the button from the back anyway, but to put it right in the middle of the cables makes it even worse, near impossible to actually find it since it’s recessed in to the unit. This is made all the more annoying when you realise that the sub makes a humming noise even when your system is powered down. The subwoofer control is located at the back as well, which again because of the dome shape, is quite difficult to adjust without having to turn the unit around. A generous amount of speaker cable is included and is wrapped with a quality fibre material as opposed to cheap plastic, this made placement of the satellite speakers more convenient. Sound quality is admittedly quite good. Audio is crisp and clear, backed by an appropriate amount of bass. I watched Iron Man with the JBL Spot, and found it to be quite enjoyable, significantly better than using my laptop speakers but doesn’t really blow you away with anything magical. What’s more impressive is the design and the fact that the satellite speakers are tiny, and yet is able to reproduce so much volume without the usual distortion that you expect. The JBL Spot manages to impress me on a different level to how I normally rate a speaker system. Coming from the perspective that if I bought this, I probably would have chosen it for its design as opposed to an expectation of amazing sound quality. 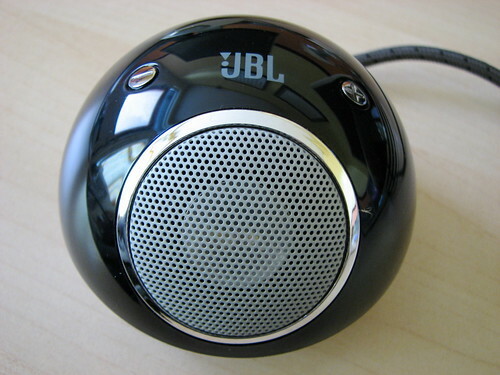 However, that’s not to say that the JBL Spot doesn’t back its design with some substance. The sound quality isn’t bad, but it isn’t astonishingly good, and perhaps not as good as I would expect a JBL system to be, but it certainly doesn’t disappoint. Rather futuristic don’t ya think? Not sure if they’re to everyones taste. They do seem to go well with your Mac though. do you notice a humming sound while they’re on but no music is playing?